Singapore’s internationally acclaimed Tiger Beer has set out to humour this festive season by asking Singaporeans to share, in the most fun and creative ways, how they have been “good this year”. With the aim of garnering thousands of tongue-in- cheek “Have You Been Good This Year?” submissions, Tiger Beer will reward fans with the best entries with invites to the brand’s biggest festive celebration yet on Saturday, 22 December at the Pit Building. To participate in the campaign and stand a chance to score a pair of invites to this exclusive event, consumers can simply log on to haveyoubeengood.sg to share how they have been good this year. Entries could be about how one has been good by “not taking an MC just to have a sleep in” or “saying yes when she wanted to watch Twilight”. To be held at the Pit Building from 8pm to 1am, the Tiger Beer Festive Party is set to take year- end celebrations to the next level with a kaleidoscopic range of light effects projected to the pumping sounds of headlining DJ’s and performers that will work the crowds till the early hours of the morning. To bring the campaign down to the streets of Singapore, Tiger Beer will launch an innovative Tiger Christmas Phone Booth installation which will pop up at prominent locations across the island in the coming weeks. Members of the public 18 years and older will have the chance to enter the specially-created booth and make a call to Tiger Beer’s “Santarina” to share how they have been good this year and why they deserve a huge Christmas present. All calls made in the Tiger Christmas Phone Booth will be recorded on video and the person with the most creative entry per location as selected by the “Santarina” will receive a year’s supply of Tiger Beer! Tiger Beer’s festive campaign is supported by advertising in the out-of-home, television, print and online platforms as well as on Facebook. 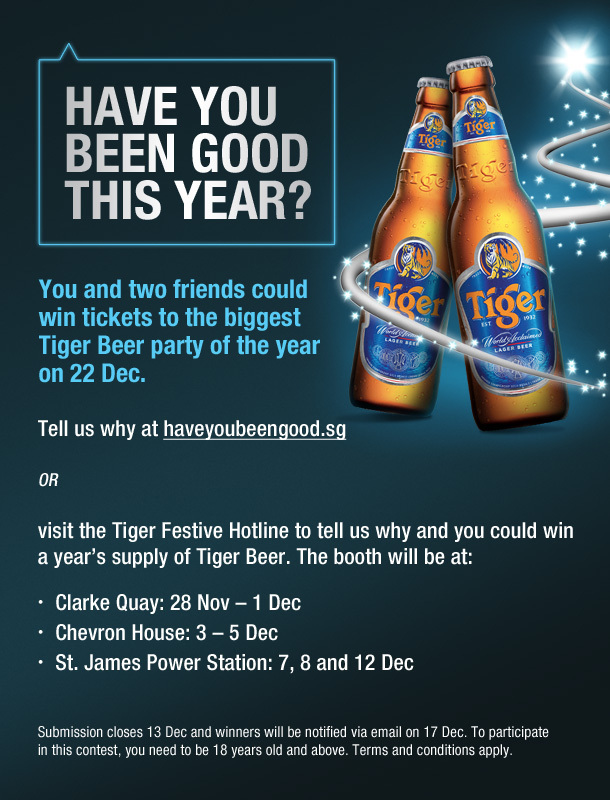 For more information about the campaign and Tiger Beer’s Festive Party on 22nd December 2012, please log on to haveyoubeengood.sg and www.facebook.com/TigerBeer.sg.